Who is Dave Does The Travel Thing? 10 backpacking tips for beginners! So following our escapades in Berlin in 2013 across my birthday, me and my buddy Matt set off to Austria and Slovakia to see what would happen this time round. Vienna is steeped in culture, it is the home of many museums and gallery’s and the legacy of the Hapsburg empire lives on in grand form. We arrived late on a Monday, and in standard form spent the evening finding food, a pub showing football (that infamous 3-3 draw between Liverpool and Crystal Palace) and chatting to people at the hostel. Tuesday marked the 1st day of real exploration. 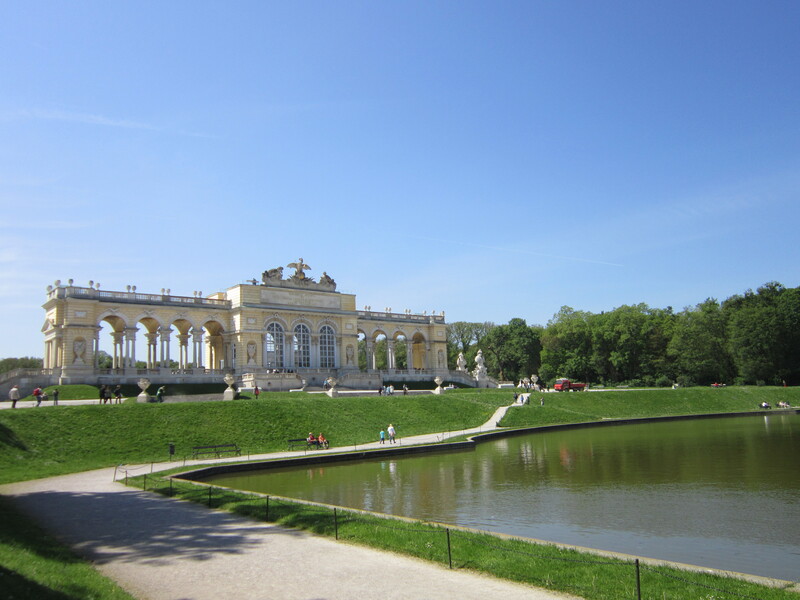 First thing we walked to the spectacular Schönbrunn Palace and it’s amazing gardens. 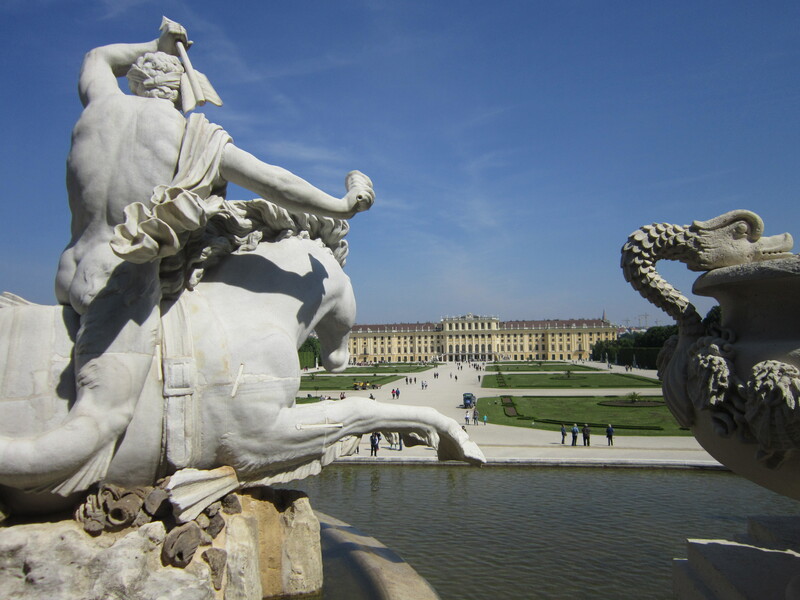 The palace was the summer residence of the Hapsburg monarchy. We did the tour (not guided) of the interior, where you see plenty of cool things like the bedchamber in which Maria Theresa slept and so forth, and then spent some time wandering around the gardens, seeing all the statues and features. 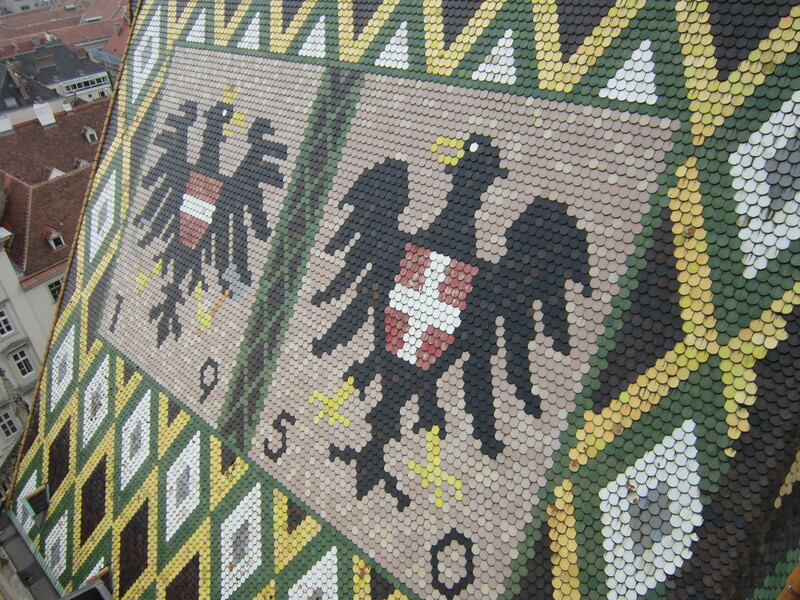 Following that we walked across the city to the Hofburg Palace, which was the other residence of the Hasburg monarchy. We went into the museum there and saw all the imperial treasure and art on display. There was table full of gold plates and adornments that particularly sticks to mind. 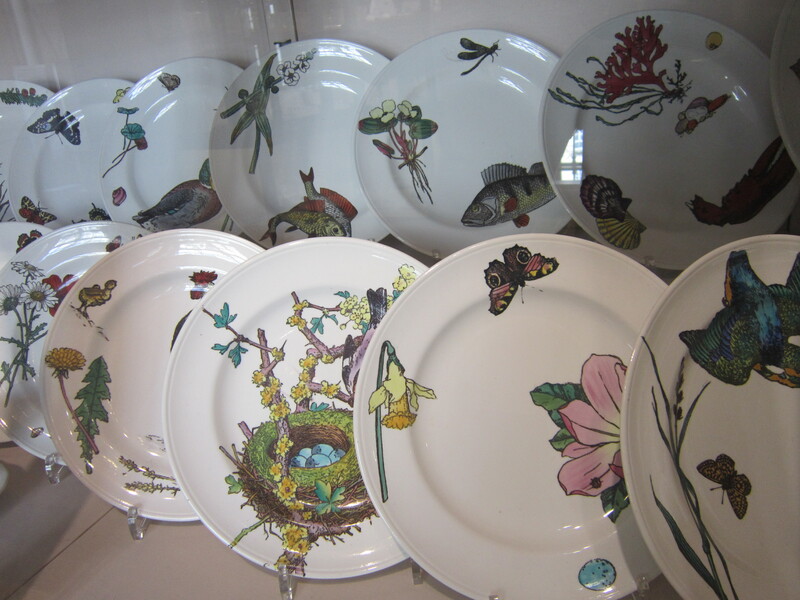 I also especially liked all the decorative plates, there was some very cool designs, many floral ones and alike. I somehow managed to loose Matt in the museum (it was big!) and with phones failing to connect I decided to go off and see the Parliament building and a couple of churches in town. Vienna architecture is pretty great, definitely worth a wander around the city. Met Matt back at the hostel later and had a few drinks, discovering the barman there is originally from pretty near me in the UK (I’m from Bath, him from just north of North Bristol). The next day, once we had managed to drag our self’s from our respective beds, was a big museum day. 1st up was the Kunsthistorisches Museum (aka the Museum of Art History). 2nd up was the Naturhistorisches Museum which is opposite. So plenty of art followed by dinosaurs. It was a good mix. The square between the 2 museums has an epic statue of Maria Theresa in it to. Following that we went to the St. Stephen’s Cathedral (Stephansdom), Matt had been up to the top the day before when we had lost each other, so it was my turn today. Great views over the city and the roof and side of the Cathedral are very grand also. That evening seemed to entirely consist of talking to Canadians in the hostel (there was loads of them!). This isn’t a bad thing as generally Canadian backpackers are great and these were no exception! We got involved in some epic 10 player (5 teams of 2) game of Ticket To Ride. Board games in a hostel with fellow backpackers is a lot of fun….and a nice change from endless ‘so where are you from?’ question that we’ve all heard a billion times. Thursday and time to say goodbye to Vienna and move onto Bratislava. We decided to get a boat along the Danube between the 2 cities, because i’ve never traveled from one country to another by boat before and it’s more fun than a train or bus! Plus its the Danube! It’s Europe’s second longest river so always been on the bucket list to travel on it, glad I got to at least for a short while! 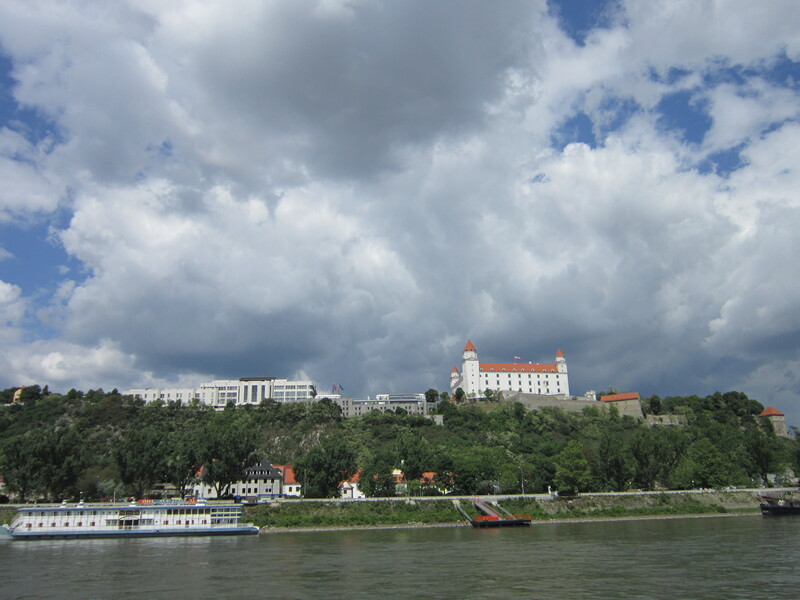 You go past Devin and Bratislava castles, which i’ll come to later. Once in the city we set about exploring. 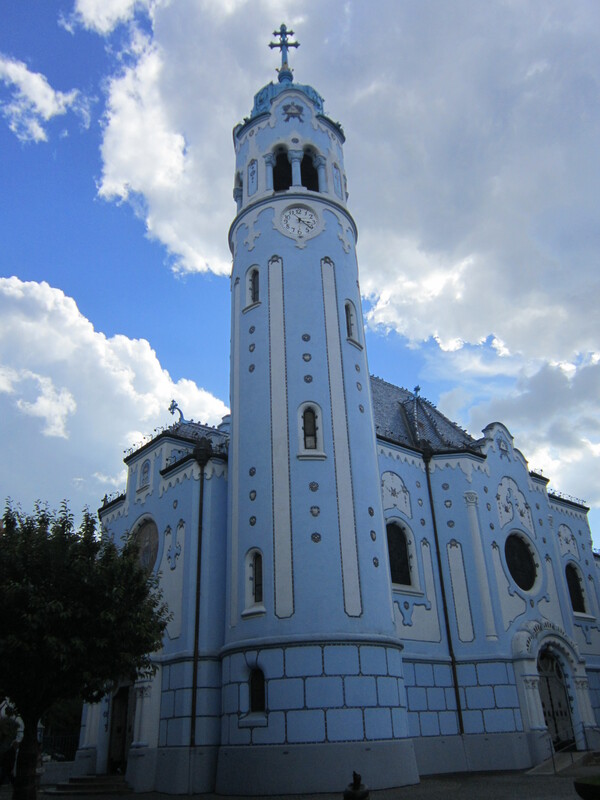 Near our hostel is the famous Blue Church, which is very pretty. We didn’t go in but you could see through to the interior and they do stick with the blue theme inside. 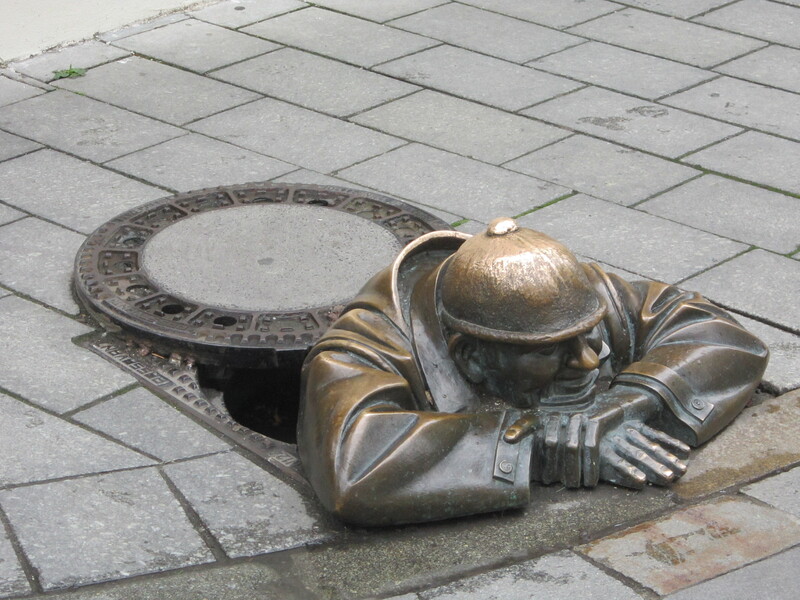 Bratislava is divided into 2 areas really, the new old town and the new town. From what I understand the Soviets wanted Bratislava to be an ‘industrial’ city and you can see how it is divided by the ‘Most Slovenského národného povstania’ Bridge across the Danube. It has a UFO shaped restaurant at the top. The other side from the old town looked like a lot of sky scrapers and soviet type buildings. We didn’t go across at all during our stay as the old town feature most of the sites and all we needed. The old town is really dominated by the Bratislava Castle, it looks over the city from it’s vantage point. 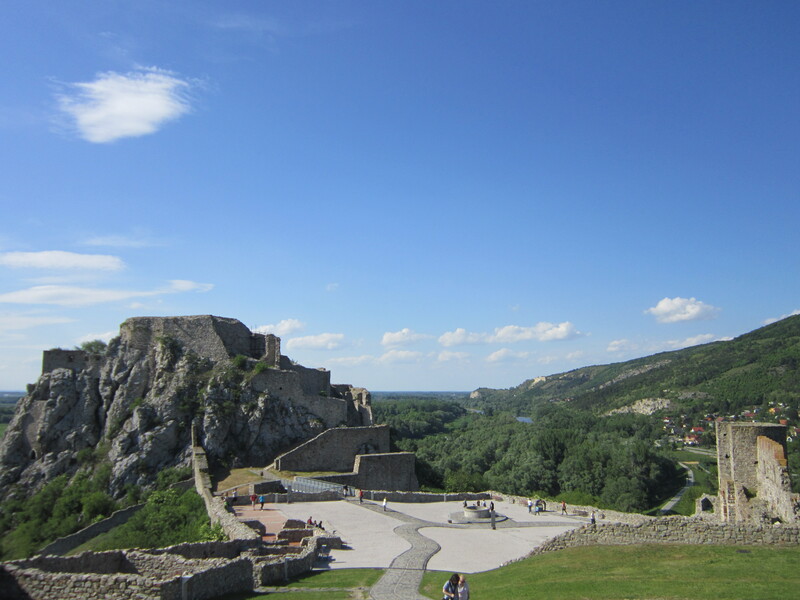 There are excellent views from it across the Danube to the other side, and around over the city, both old and new. 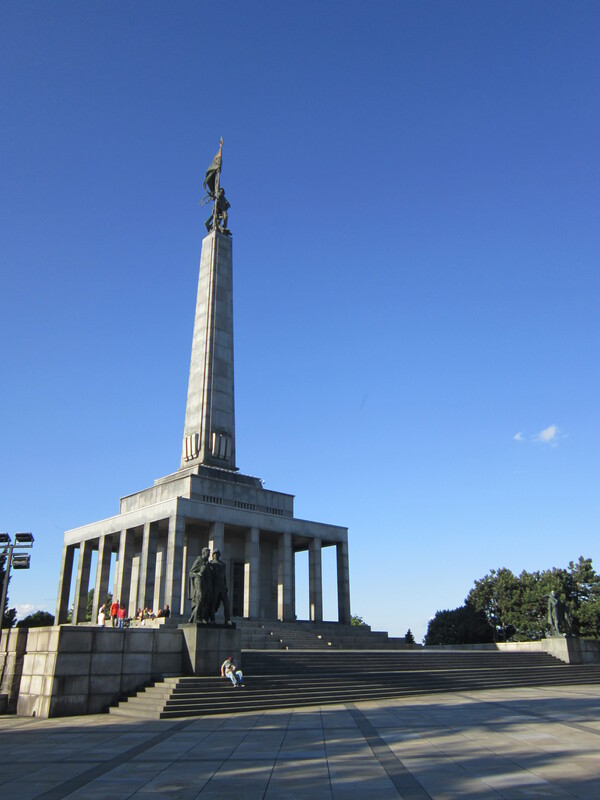 After that we headed to the Slavín War Memorial which overlooks the city. Fittingly this was exactly one year after visiting the Soviet war memorial in Berlin. It is a cemetery for Soviet soldiers who dies fighting the Nazi’s for the city. Friday was my birthday, wahoo. We went to the museum in Bratislava castle which was pretty interesting and there was some good art found inside. and we also went to one in the city that sort of went up and up floors until you overlooked the main square (it was the Bratislava City Museum, and concerned the history of the city which was cool). Walking around the city there are a lot of statues, and it’s fun to find them all. The most famous is Cumli, which is the guy pictured below! In the evening we went to a rock bar named Randall’s and attempted to drink it dry. Wandering around very drunk afterwards, we made friends with 3 local girls and proceeded to drink more at a bar they like (called British Rock Stars) before somehow magically getting back to the hostel (I think they had to guide us!). The next day we met up with them and we all got the bus to Devin castle. It’s really nice out there and we spent the day sitting around overlooking the Danube talking and chilling out. Incidentally it’s the spot which separates Slovakia and Austria and there is a memorial to mark all the Soviet/Slovak citizens who lost there lives trying to cross over to the West. In the evening we got some food with our new friends and then hung out by Bratislava Castle for awhile, before saying our goodbyes as we had a long trip home the next day. A great trip, much history and art and great people! Interesting info and gorgeous photos. Vienna is already on my long list of places to visit. Thanks Millie. It’s a great place for art and culture, though I imagine it could have been a bit of an overload if i’d stayed there for longer! It really is, enjoyed it a lot! HI AND WELCOME TO MY BLOG! I’M DAVE AND THIS IS ALL ABOUT TRAVEL. I LOVE SHARING MY THOUGHTS AND TIPS ABOUT DESTINATIONS AS WELL AS OTHER TRAVEL RELATED CONTENT. I HOPE YOU ENJOY READING THIS BLOG AS MUCH AS I ENJOY WRITING IT! FEEL FREE TO LEAVE A COMMENT ON ANY OF THE POSTS OR MESSAGE ME ON SOCIAL MEDIA.